A few months ago, a friend asked if I could put together a corporate presentation on Prague for the American media company HBO, which had established a regional HQ here. The presentation would introduce the city to new employees moving here from all around Central & Eastern Europe. “Be funny,” he said, “but give them information to help them understand the city.” I thought about it for a while and then it came to me: architecture. Prague’s story is written on its buildings, and if you can’t decipher the text, you’ll never get the plot. I’ve been meaning to publish a primer on Prague architecture for a while, so here goes. What follows is a mash-up of that HBO presentation and information I wrote for Lonely Planet’s guide to Prague & the Czech Republic. I have so many photos, I decided to break this post into two parts. This week, I'll focus on older styles from Romanesque and Gothic, all the way up to the 19th century; in Part 2, I'll get into Secession & Art Nouveau, Cubism, Functionalism, and some Communist-era stuff. Top Photo: Prague boasts a variety of architectural styles from different centuries and eras that many visitors may not be aware of. In this photo of Old Town Square, alone, there's 'rococo' on the left, early-Gothic in the middle, the high-Gothic spires of the Týn church in the backdrop, and a row of baroque houses on the right. Photo by Mark Baker. Posted in Diversions, Life In Prague and tagged Architecture, baroque, Czech, Czechia, gothic, history, Prague, renaissance, style. The "City of a Hundred Spires" could almost as easily be called the "City of 100 Baroque Domes." Photo by Mark Baker. 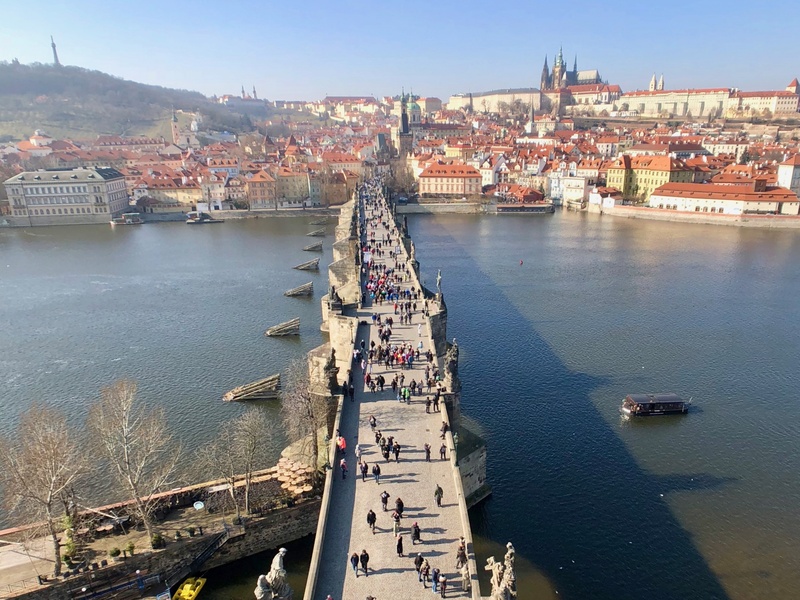 The Charles Bridge is a graceful fusion of a Gothic base from the 14th century and baroque statues added two centuries later. Photo by Mark Baker. A view out over Old Town Square, with the baroque Church of St Nicholas in the background. Photo by Mark Baker. At the outset, I should say that all the usual caveats apply. I wish I had studied architecture – or even European history – in college, but alas I was poli-sci. At graduation, I doubt I could have told you much about Gothic or baroque or anything else concerning architecture. I can’t even recall how much we were taught about Czechoslovakia back then. Probably not very much. That means almost everything I’ve learned about Prague’s architecture, I’ve had to cobble together on the fly, both through living here and writing about the city (and I’m still learning). That also means, though, that I can definitely relate to the average guy who pitches up on the shores of Bohemia with only the vaguest notion of what all the intricately notched buildings, bridges, and churches actually mean. I was once that guy too. 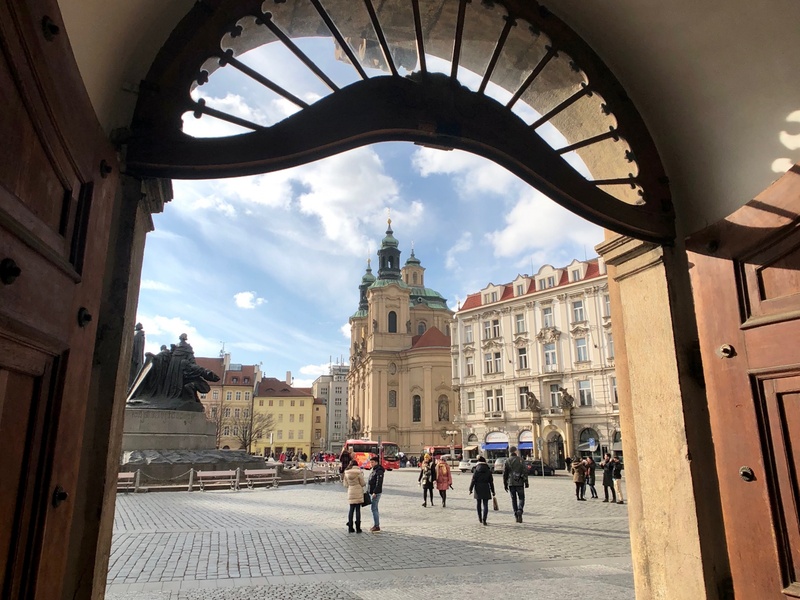 The oldest surviving structures in Prague date back to around the turn of the first millennium, so -- give or take a century -- we’re talking about 1,000 years of architectural history. Over that period, conveniently spaced at around 200-year intervals, the social, economic, cultural, and religious forces conspired to provoke profound changes in the ways people built and viewed their buildings. 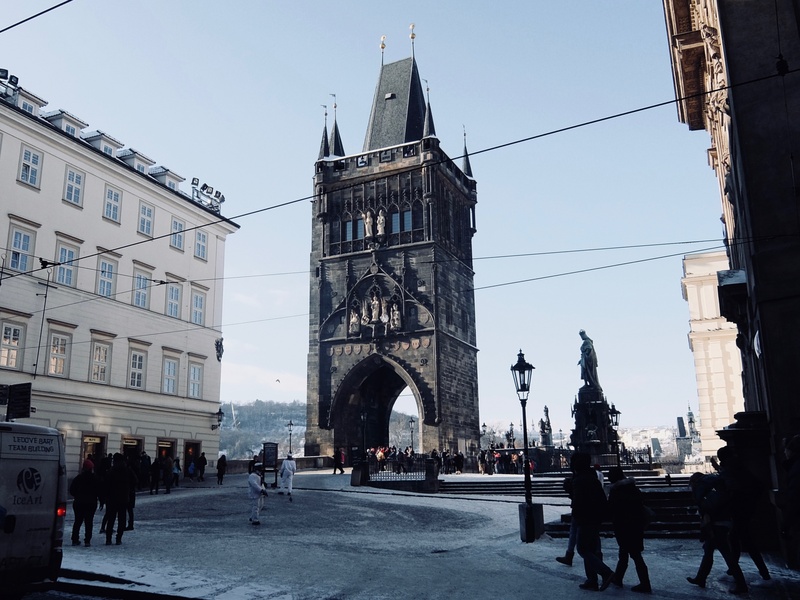 That’s not all that different from the rest of Europe, but the deal-breaker for Prague is that the city escaped serious physical damage in wartime (aside from the occasional tragic fire or marauding Swedes). That’s especially significant with respect to World War II, which led to the destruction of both Berlin and Warsaw, and the loss of big parts of Vienna too. Prague was somehow "fortunate" enough (if that’s the right word) to be the first major city occupied by the Nazis (Vienna might disagree, but that’s for another post) and the last to be liberated by the Allies. As a result, most of the old buildings are still standing. Before we get into specific styles, one more caveat: When it comes to Prague's architecture, not everything is as it appears. First off, architects in the 19th century seemed to lack for original ideas, and that century is characterized by lots of imitation. In practice, that means many buildings around town look as if they might be centuries old but in fact are much younger. Secondly, many buildings are actually one style on the outside (say, Gothic) and another style (say, baroque) on the inside. The analogy here might be a 1950s suburban ranch house in the United States. The exterior says mid-century modern, but the shag carpeting and harvest-gold appliances in the kitchen scream 1970s’ excess. A lot of redecorating went on over the years. The Romanesque rotunda of the Holy Cross (from the late-11th century) is a relic from a different era, 500 years older than the houses around it. Photo by Mark Baker. 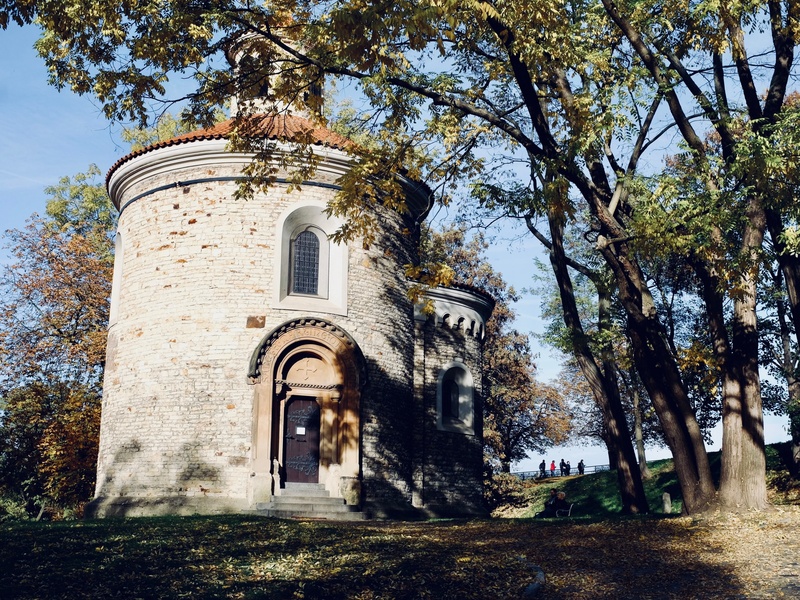 The Romanesque Rotunda of St Martin at Vyšehrad Citadel, dating from the 11th century, is often credited as the city's oldest surviving building. Photo by Mark Baker. The proud Gothic Old Town Tower at the eastern end of Charles Bridge. Photo by Mark Baker. 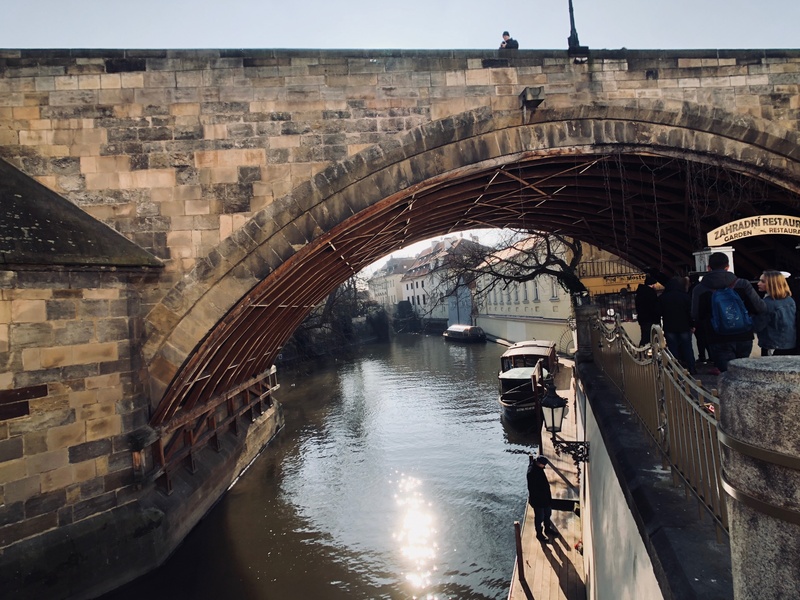 The arched Gothic base of Charles Bridge harmonizes perfectly with the waterways and houses of Kampa Island below. Photo by Mark Baker. 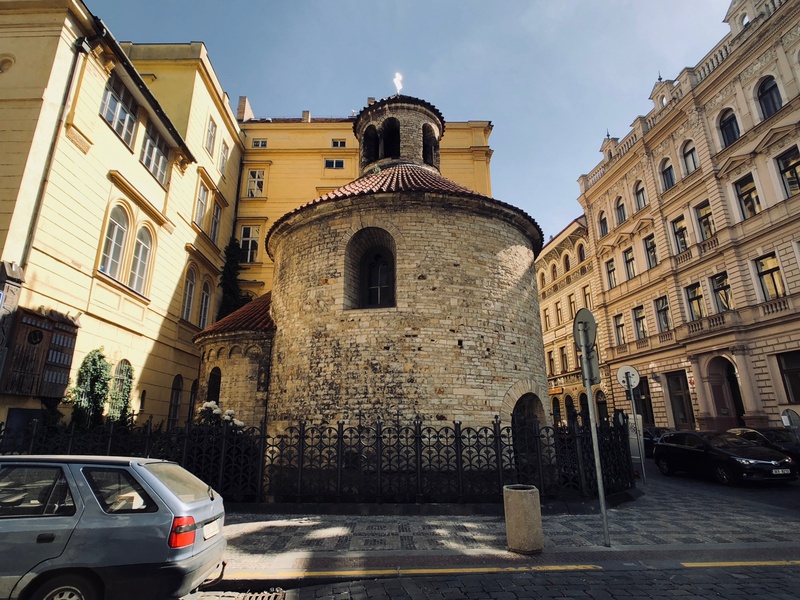 Prague’s oldest surviving buildings are “Romanesque,” a style that swept across Central Europe with the spread of Christianity from the 10th to the 12th centuries. It’s a relatively underappreciated style, given the fact it’s associated with the earliest days of the Bohemian (Czech) kingdom. You can identify Romanesque structures from their rounded facades, arched doorways, barrel-vaulted ceilings, and massive exterior walls. Prague's best-known Romanesque building is the interior (but not the exterior) of the Basilica of St George at Prague Castle, though the style seems most at home in the handful of stone rotundas (circular churches) that spring out of the ground like mushrooms in wholly unexpected places – like the Rotunda of St Martin at Vyšehrad Citadel and the Rotunda of the Holy Cross (both late-11th century) in a quiet, residential part of the Old Town. Romanesque evolved into “Gothic” architecture in the 13th century and lasted to around the 15th century. For us non-architecture majors, this is the style we’re probably most familiar with – but not from Prague, but rather the Cathedral of Notre-Dame in Paris. By all accounts, Gothic was a significant upgrade from Romanesque and resulted from major strides in building techniques and material well-being. If there’s a style that best captures Prague’s mood – and the pride of its residents – it would be Gothic. This type of architecture flourished in the time of Holy Roman Emperor and Bohemian King Charles IV (1316-1378) in the 14th century and remains indelibly associated with his rule (a high-point for the city and the Bohemian crown). From his seat at Prague Castle, Charles aspired to build a capital worthy of his domain: an association of city states and principalities across Europe known as the “Holy Roman Empire” -- and that’s exactly what he did. You can identify Gothic buildings by their soaring towers (some, these days, topped with spires), flying external buttresses, ribbed vaulting, intricately carved windows, and stained glass. A list of significant Gothic structures reads like a “who’s who” of local architecture. That list would include the some of the external walls and ornate interior chapels (but, oddly, not the nave, which came later) of St Vitus Cathedral, the interior of the Old Royal Palace at Prague Castle, the Old Town Bridge Tower, the Church of Our Lady before Týn, the Old Town Hall Tower, and even the base (but not the statues) of Charles Bridge, construction of which began in 1357. 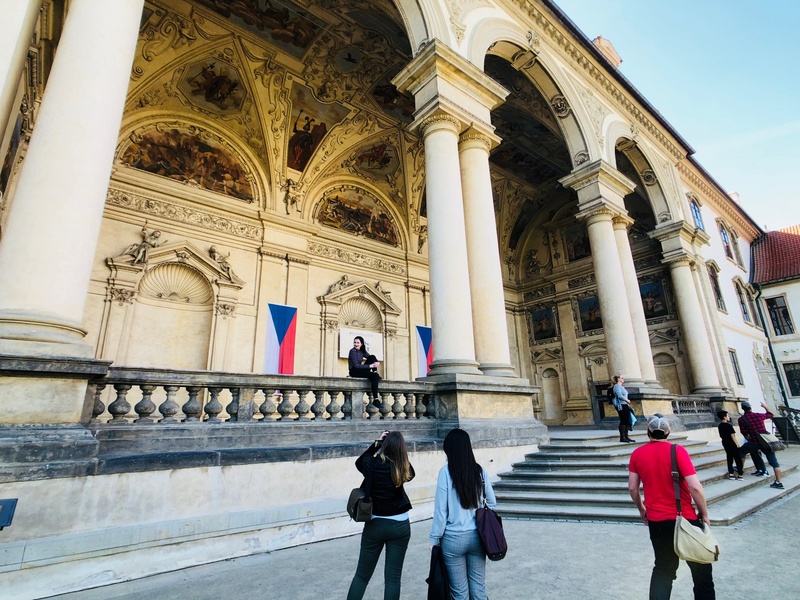 The best example of pure Renaissance, with its perfectly spaced-out columns, is the Summer Palace in the gardens north of Prague Castle. Photo by Mark Baker. A telltale marker to spot a Renaissance building is simply to look for the 'sgraffito.' Photo by Mark Baker. Photo by Mark Baker. To spot some great 'sgraffito,' check out the House at the Minute, to the left of the Astronomical Clock on Old Town Square. Photo by Mark Baker. The Wallenstein Gardens sports architecture from both the late-Renaissance period -- such as these evenly spaced columns -- and early baroque. Photo by Mark Baker. The history of the Bohemian kingdom, through the ages, is a parade of highs and lows that would make for an excellent TV series (maybe I should have alerted HBO?) The highs of Charles IV and Gothic architecture were followed by the lows of the Hussite religious wars of the 15th century. Those wars ended Prague’s early imperial phase and ultimately allowed for the entry of powerful Austrian nobles into the Bohemian lands. Indeed, Prague and the surrounding countryside would end up serving the Austrian Habsburg crown all the way until the end of World War I. Anyway, back in the 16th century, as the nobility was asserting control, Gothic had fallen way out of fashion. The new crowd preferred the more-mannered “Renaissance” style then emerging out of Florence. The Italians looked to classical Greece and Rome for their inspiration and brought with them an enthusiasm, lacking under Gothic, for symmetry and proportion. Buildings would be laid out with an almost mathematical precision, with columns and pillars spaced at regular intervals. Only a handful of pure Renaissance buildings have survived to the modern day. Many structures were later refurbed into baroque or other styles, though their Renaissance bones can still be seen in their mathematical purity. One easy trick to identify a Renaissance building is to look for the sgraffito (from the Italian word “to scrape”) on the exteriors. 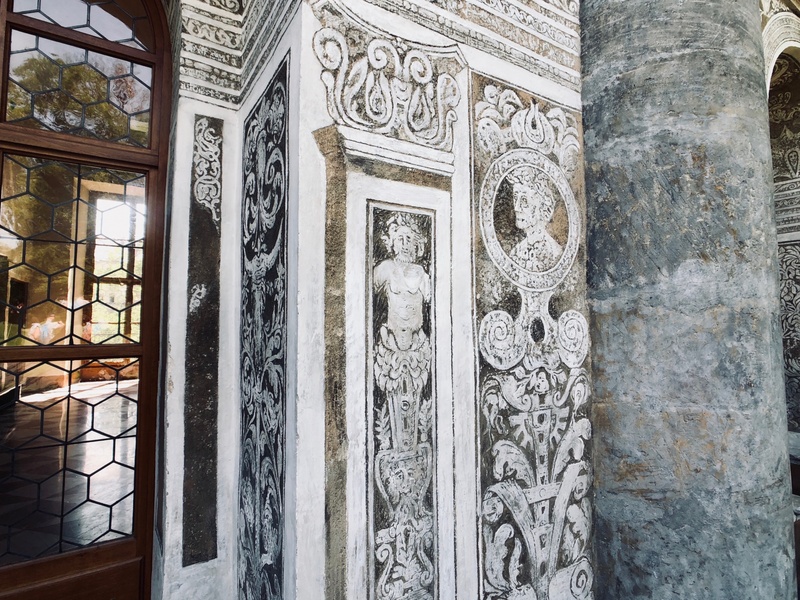 This was a popular ornamental technique to create patterns on the facades by scraping through an outer layer of pale plaster to reveal a darker surface underneath. 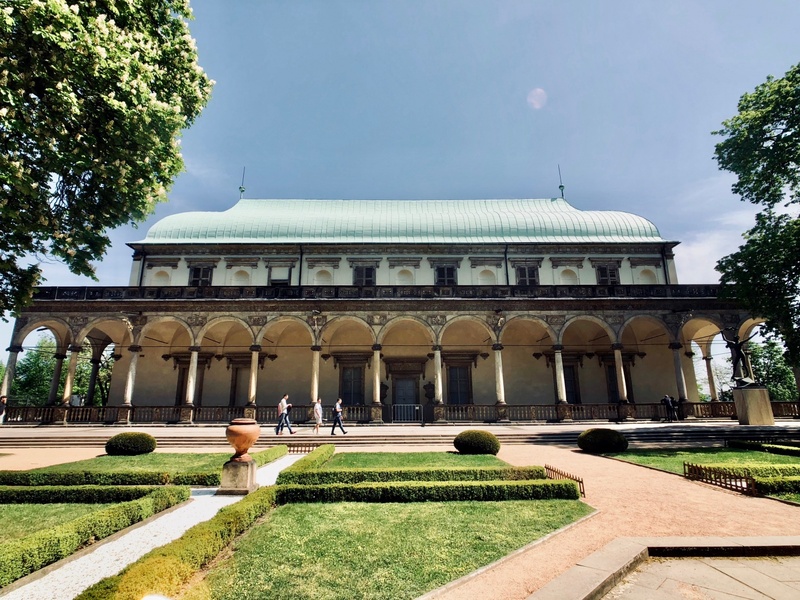 The best example of pure Renaissance, with its perfectly spaced-out columns, is the Summer Palace in the gardens north of Prague Castle. 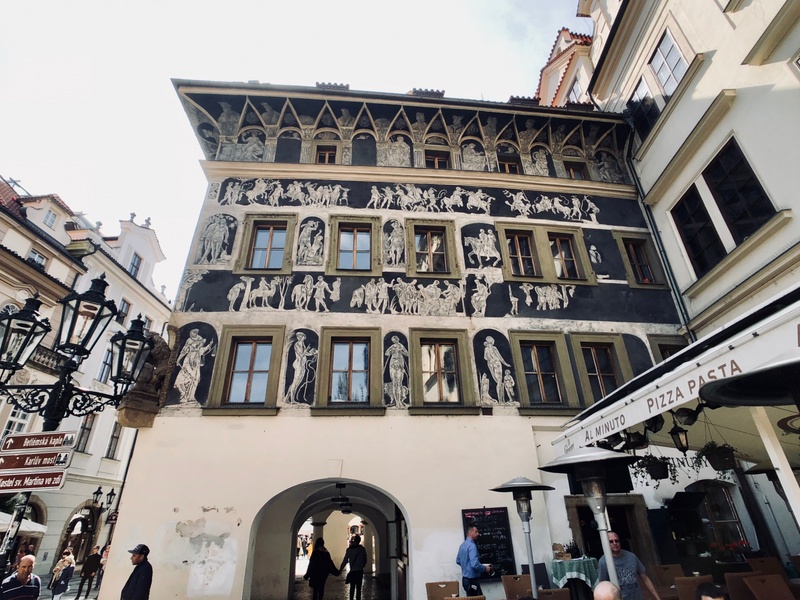 To spot some great sgraffito, check out the Schwarzenberg Palace, not far from the main entrance to Prague Castle, or the House at the Minute, just to the left of the Astronomical Clock on Old Town Square. Another one of those periodic lows came later, in the 17th century, with the Thirty Years’ War (1618-1648), a Europe-wide conflict that somehow still resonates in Prague (it’s when those marauding Swedes came to town). Like the Hussite wars of two centuries before, the Thirty Years’ War was a religious battle (at least at the start), pitting Catholics vs. Protestants. The Catholics and their strong backers, the Austrian Habsburgs, emerged as the ultimate victors. That’s a simplistic, but useful way to view “baroque,” the next major architectural movement to spread to Prague. Baroque was largely an expression of the tastes of the Catholic Church and nobility as they extended their influence to Bohemia. Baroque buildings exhibit many of the same rules of symmetry prized under Renaissance but put more of an emphasis on bling. Telltale markers of baroque buildings include their bombastic size, OTT interiors, marble columns, florid sculpture (all those cherubic putti everywhere), richly frescoed ceilings, and copious use of glittery metals like gold. Baroque buildings are all around Prague and include many of the most-famous houses of worship, such as both churches named after St Nicholas (one in Malá Strana and the other just off of Old Town Square). 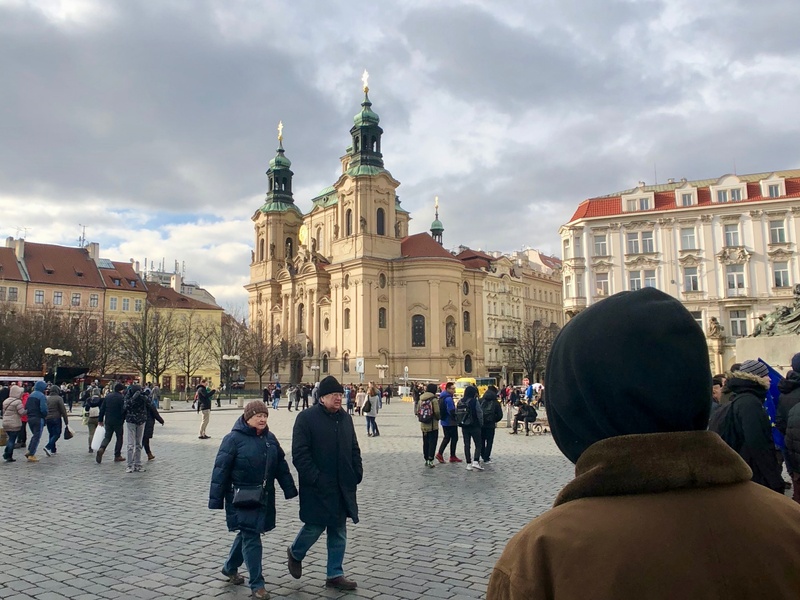 In addition, several well-known churches, such as the Church of Our Lady before Týn on Old Town Square and St Giles in the Old Town, are also deceptively “baroque." Both are clearly Gothic from the outside but unbridled baroque on the inside. The Habsburgs made especially good use of baroque pageantry on Charles Bridge, adding several highly expressive, overtly religious statues to the balustrades over the 17th and 18th centuries. 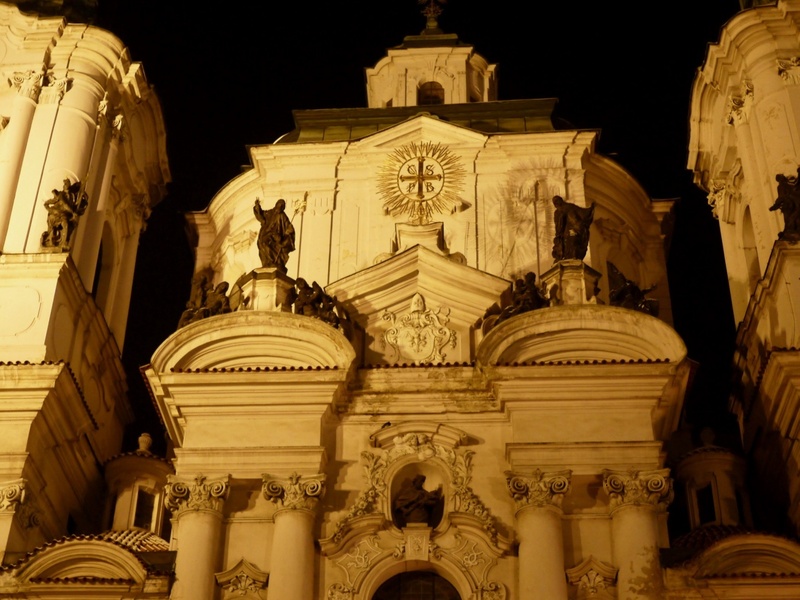 The best examples of secular baroque are the burgher houses that line Old Town Square and the noble palaces of Malá Strana. 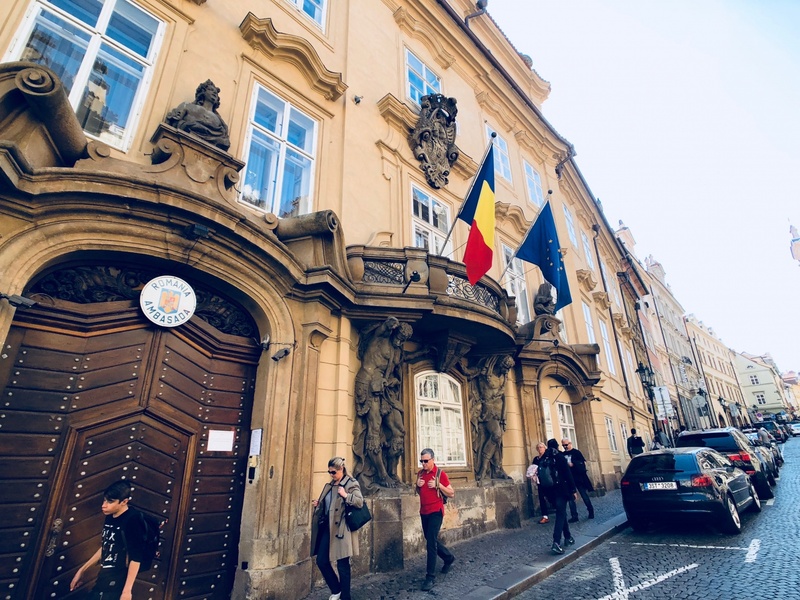 Among the latter, my personal favorite is the Morzin Palace on Nerudova street (now home to the Romanian Embassy), with its exaggerated statues of two Moors holding up a balcony. The author of those figures, Ferdinand Maxmilián Brokof, designed several of the statues on Charles Bridge. 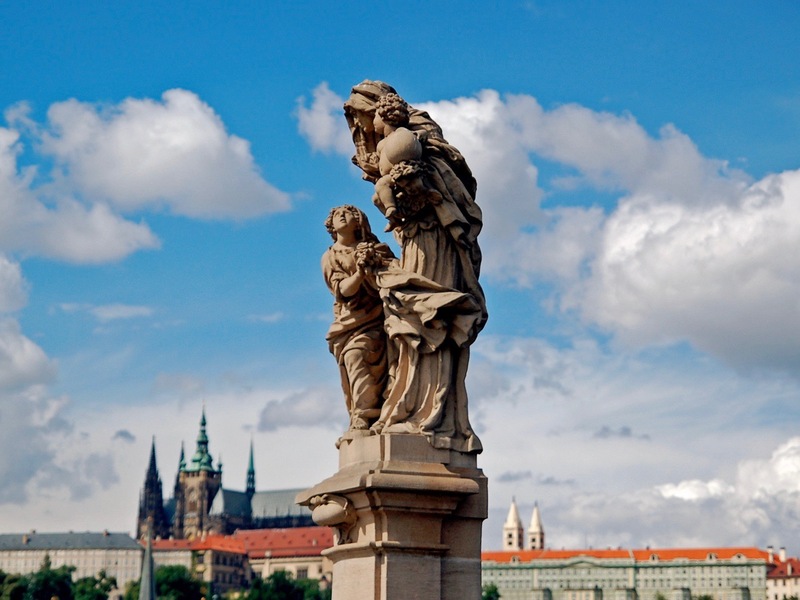 The baroque statuary on Charles Bridge both contrast with and compliment the Gothic towers of St Vitus Cathedral and Prague Castle in the background. Photo by Mark Baker. 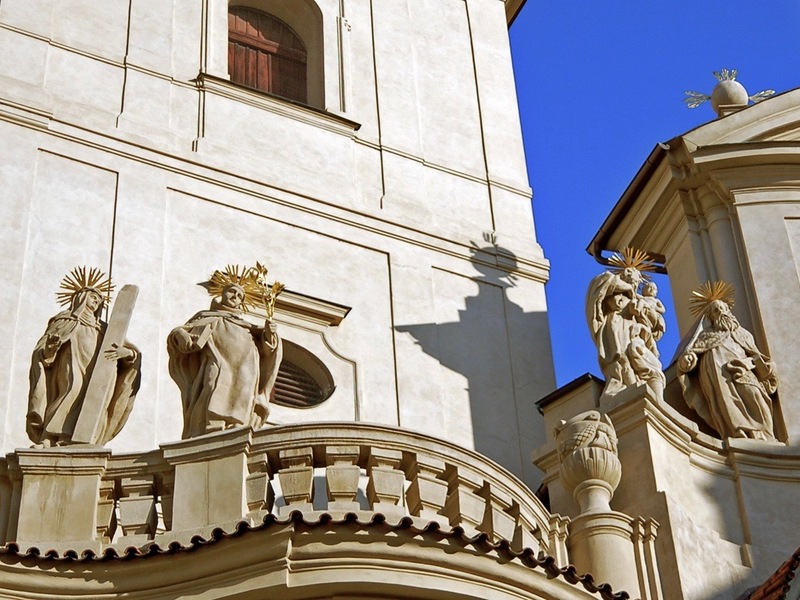 Even the most hard-hearted atheist couldn't help but be swayed by the lyric facades and beckoning saints atop the Church of St. Salvator, at the Old Town end of Charles Bridge. Photo by Mark Baker. The Morzin Palace on Nerudova street in Malá Strana (now the Romanian Embassy) is a classic example of high baroque, with its hyper-realistic statues of two Moors holding up a balcony. Photo by Mark Baker. 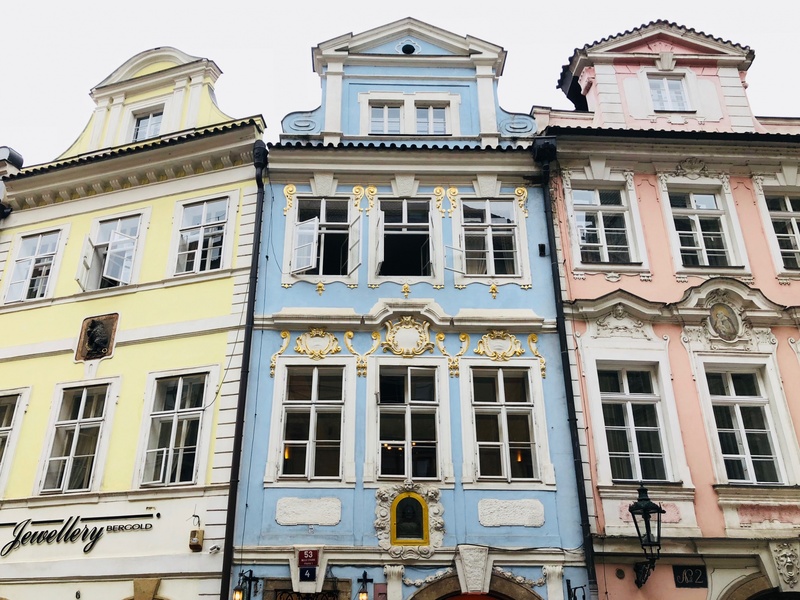 Colorful baroque townhouse facades bring a kind of 18th-century Vienna feel to the street on the Malá Strana side of the bridges that leads to Charles Bridge. Photo by Mark Baker. 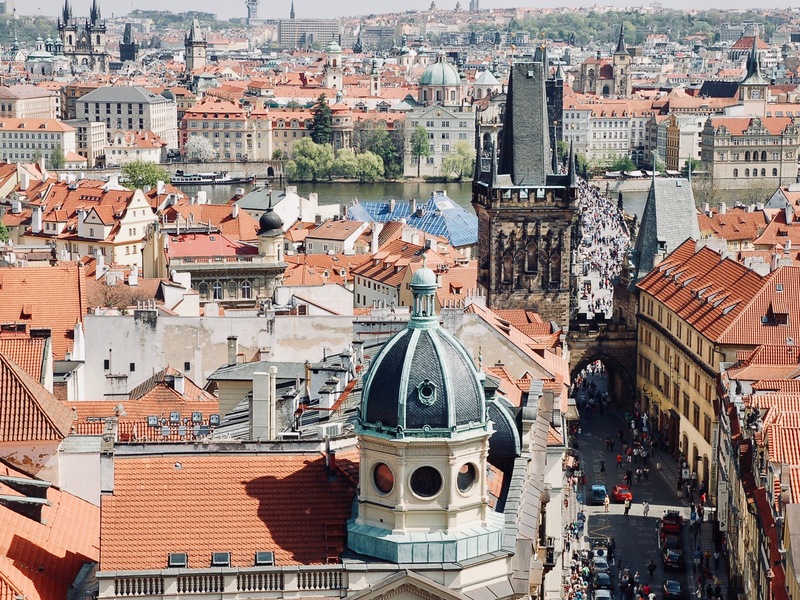 Fast-forward to the 19th century, and the industrial revolution spurred both a building boom and a revival of Czech (as opposed to German-speaking Austrian) culture. Hundreds of buildings were constructed or remodeled at the time, though as luck would have it, the then-popular architectural style – neoclassical – was uncharacteristically dull. Neoclassicism – or historicism – was essentially a Viennese importation and meant architects should look backward to historical styles for their inspiration. It was a kind of reaction to the lyrical excesses of baroque, which admittedly had gotten out of hand. Most architects went for a kind of subdued, classical elegance: faux columns, stern facades, and sober decoration. The buildings are undeniably pretty but – well – a little boring. As the century progressed, architects borrowed from other historical styles like Renaissance and Gothic (creating neo-Renaissance and neo-Gothic). Neoclassical and the other ‘historicist’ styles are closely associated with the revival at the time of a Czech national identity. The National Theater and National Museum were both built toward the end of the 19th century in neo-Renaissance style (though they look much older). These buildings are noteworthy not so much for their groundbreaking style, but rather as symbols of this emerging national consciousness. And, yeah, all those gleaming Gothic spires on the buildings that gave Prague its nickname as the “City of a Hundred Spires”? Most aren’t actually several centuries old, but came in a frenzy for neo-Gothic remodeling at the end of the 19th century. But they’re still cool. Go to Part 2 for a discussion of Art Nouveau, Functionalism, and all of the other styles that came after architects realized neoclassicism was a dead end. You can find descriptions and addresses for most of the buildings I've mentioned here on the extensive Lonely Planet Prague website. 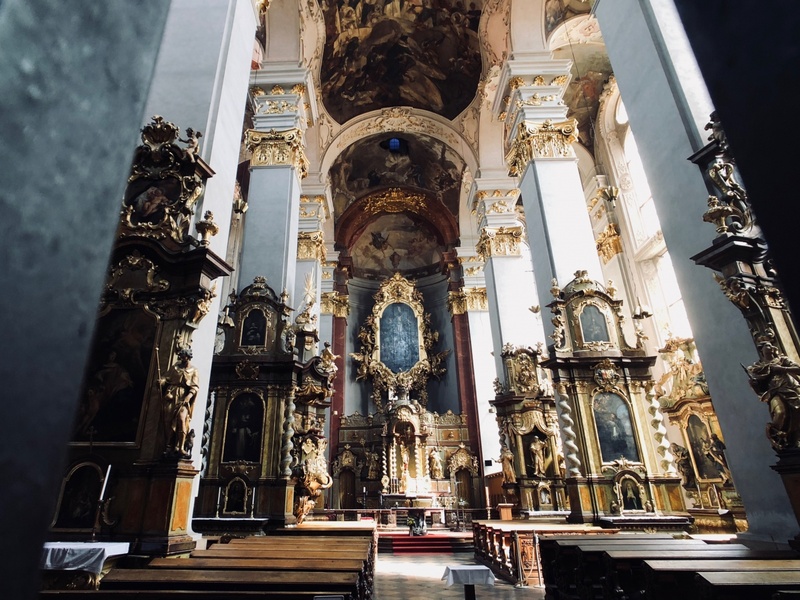 Baroque design consciously evoked religious imagery as a way of expressing the power and influence of the Catholic Church and as an appeal to the masses to join up. Photo by Mark Baker. St Nicholas Church forms the pretty baroque backdrop to this photo of Old Town Square. Photo by Mark Baker. The elaborate interior of Old Town's St Giles Church screams baroque, though the building's exterior is pure Gothic. Photo by Mark Baker. 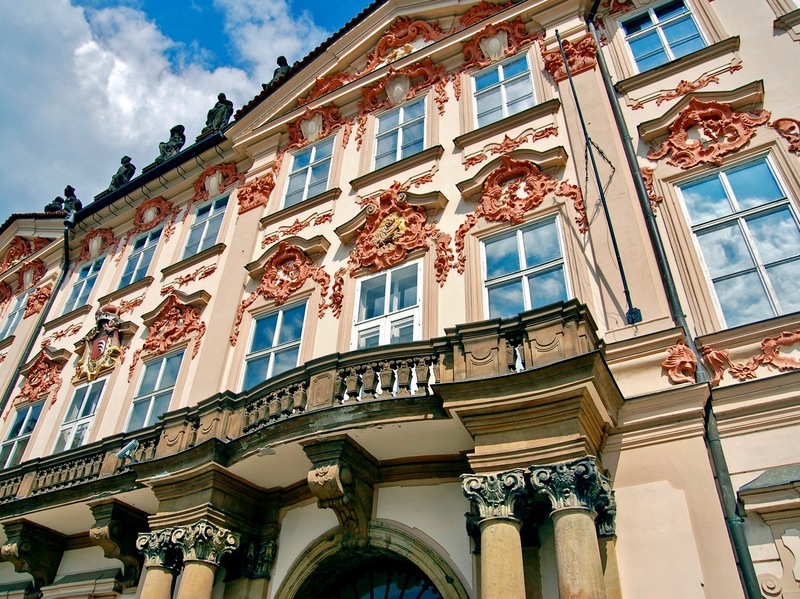 The 18th-century Goltz-Kinský Palace on Old Town Square shows off an elaborate, late-baroque style known as 'rococo' -- it's kind of baroque on steroids. Photo by Mark Baker. 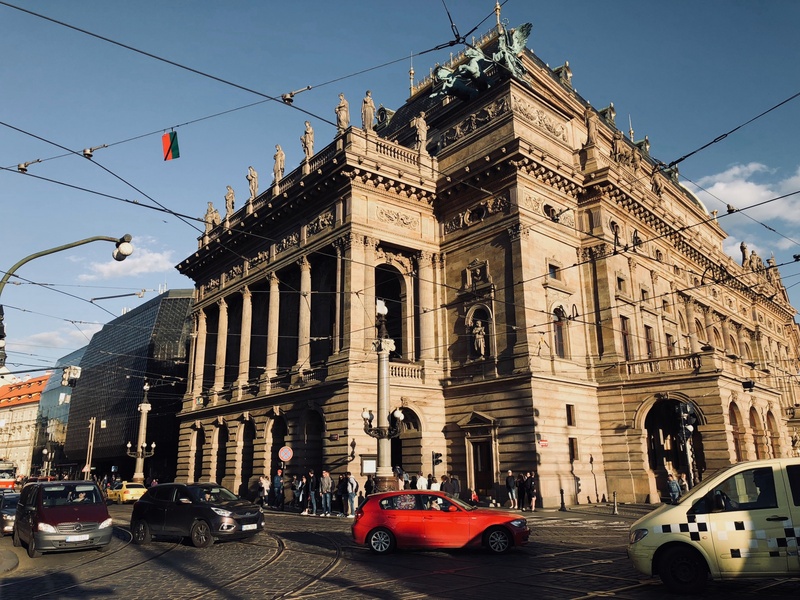 The National Theater is a building Czechs are justifiably proud of, though the structure's architectural style of neo-Renaissance is a conscious imitation of earlier styles. Photo by Mark Baker. 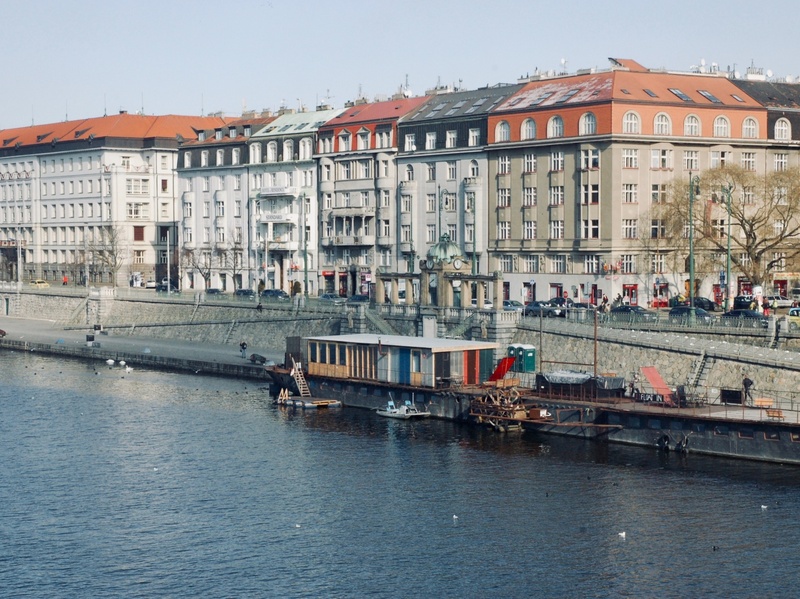 The beautiful neoclassical townhouses along the Vltava River, like many of Prague's buildings, are deceptively 'old.' These were actually built in the 19th century. Photo by Mark Baker. Great article, informative and concise. I love your style (rococo = baroque on steroids :D). 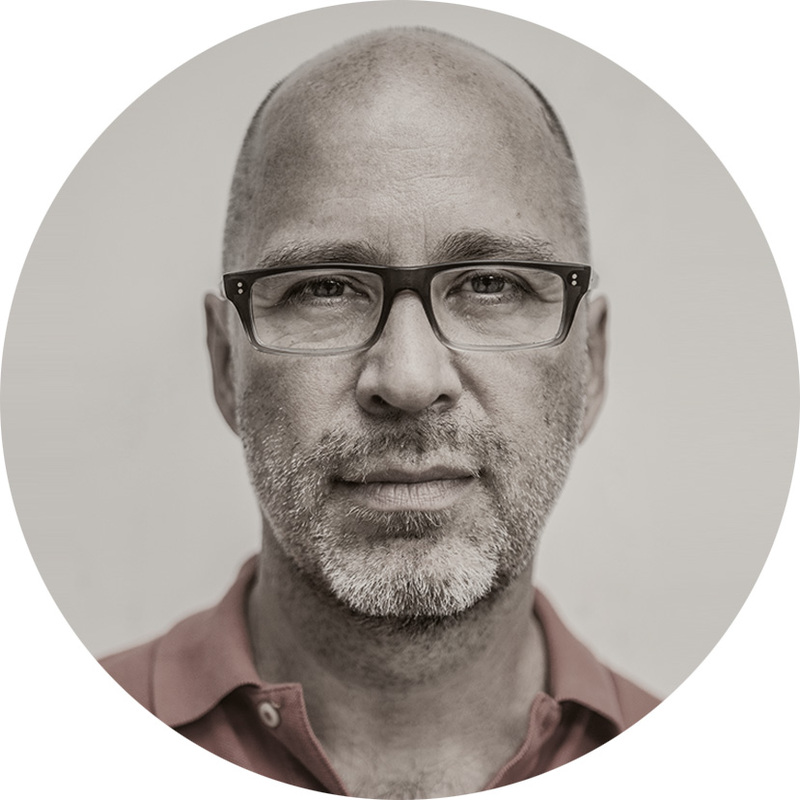 It’s easy to understand the idiosyncrasies of each style and period owing to your photos. Looking forward to part 2. Seconded. Thanks to you, Mark, I now know that the style I’ve long loved to loathe is Baroque. Thank you, man! Likewise, I now know that the Renaissance is my favorite. Definitely looking forward to your continuation. Thanks for the article and pictures. My wife and I visited in 2014; what a wonderful city. Prague has a rich history and there is so much to see. The city is steeped in history and religion. Is that protester still at the castle?